A global war couched in the language of religion; an invasion disguised as a liberation; increasingly porous boundaries between war and peace--this is Brecht's setting for Mother Courage and her Children, a play about the Thirty Years' War. Delivering goods to the front to sell them over market price is Mother Courage's particular line of business; she acquired her name when she drove her wagon through the bombardment of Riga in order to sell fifty loaves of bread. Brecht wrote this play in 1938 when it was becoming clear that one world war was going to be followed by a second. Today we have our own wars and our own war profiteers to worry about, and it is in relation to them that we must measure the significance of this play. Mother Courage would seem a perfect play for a time when the Pentagon has opened a criminal investigation into the "potential overpricing" of fuel transported into Iraq by one of Haliburton's subcontractors. The production of Mother Courage presented by the Classical Theatre of Harlem under the direction of Christopher McElroen follows Brecht in creating a historical world that resonates with the present. The excellent set (Troy Hourie) and costumes (Kimberly Glennon) evoke a world of poverty in which history seems to have left only the most occasional traces. 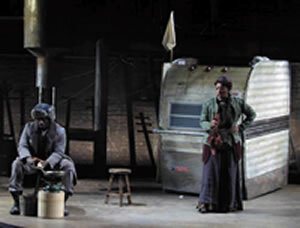 Mother Courage's creaky wagon is reminiscent of a modern car trailer, but it is so run down that it might as well be from the seventeenth century. Even the revolving stage is primitive and has to be laboriously set in motion by the actors themselves. The poverty of the set seems to bridge four hundred years with ease. The stage, the ragged clothes, the primitive goods and the beaten-up canteens seem timeless and suggest that history happens only to the rich. The production is thus finely attuned to Brecht's sensibilities, his insistence on individual, historical objects and gestures--putting on a pair of red shoes, selling a chicken--which the play isolates and strings into a series of acts that the audience must then transpose into the present. The actors likewise work toward a Brechtian estrangement, a mode of acting that is less interested in the creation of consistent and continuous characters than in assembling individual situations and decisions. Leopold Low as Eilif, Michael Early as the Chaplain, Anna Zastrow as Yvette, Oberson K.A. Adjepong as the Cook and James Rana as the Sergeant and the Lieutenant manage to create complex characters in the midst of Brecht's disjointed plot without losing the audience. Of course, any production of Mother Courage stands and falls with the lead actor. The play's focus on this one figure is relentless, and almost any actor other than Helene Weigel, to whom the play is tailored, is in for an uphill struggle. Gwendolyn Mulamba comes as close as anyone I have seen to presenting a new Mother Courage, one that is continuous with Brecht's spirit without simply emulating his greatest actor. The production, however, is not just a diligent exercise in Brechtianism, especially when it comes to the play's interspersed songs. Instead of using Paul Dessau's original score, derived from European folklore and other popular genres, William "Spaceman" Patterson, Co-Founder and Artistic Director of The Classical Theatre of Harlem, transposes Brecht's lyrics into an American musical idiom that mixes various styles and modes from R&B through classical jazz to funk. This is an inspired way of moving Mother Courage to New York, and in particular to Harlem. In fact, the new score works better than Dessau's in that it estranges the different characters more thoroughly and adds new and different layers to the entire play. When the Pastor sings the "Song of the Hours," he suddenly turns into Mr. Cool, dark sunglasses and all, very much in contrast to both his stage persona and the content of his song. Mother Courage's "Song of the Great Capitulation," one of the great moments in this production, is sung with a subdued affect that stands in contrast to the high drama to which it responds. McElroen's production thus works in a Brechtian vein, sometimes dutifully but mostly with inspiration. But it also wants to do more, namely show that the play is directly relevant to our own time. It is here that the direction becomes unsteady. Confusingly, soldiers from both sides are identified as American, with one side freezing into a tableau of the Iwo Jima memorial, adorned with an unnecessarily heavy-handed "for sale" sign, while the other side sings the Battle Hymn of the Republic. More troubling, Brecht's inter-titles, which summarize the action of each scene ahead of time to undercut suspense, are brought to us by Fox News on five monitors distributed across the stage. I suppose this is meant to make us think about who gets to tell our history, and this is surely a question worth raising. But it is at odds with the structure of the play. The history of Mother Courage is not supposed to be presented as partisan propaganda, but as a chronicle from which we have to draw our own lessons. The problem with the production's contemporary references is that applying Mother Courage to the present is a complicated affair, if only because the play does not have a simple moral. One by one, the war takes Mother Courage's children, and yet Mother Courage does not draw any lessons from her losses and remains invested in the war. This lack of learning is not for want of love. Mother Courage does everything to save her children from the war. In the end, she even refuses an advantageous marriage that would force her to abandon her mute and disfigured daughter. It is despite this love that Mother Courage goes on following the army, buying cheap and selling dear, taking the risk that is her advantage, haggling over the price of goods while her children disappear. At times, the production brilliantly captures the entanglement of market and love. Toward the end of the play, Mother Courage looks at her dead daughter in horror and disbelief, and then she takes the hat and the scarf off the corpse--she does not know whether to keep them as mementos or to sell them to the highest bidder. But the most difficult thing about Mother Courage remains the fact that Brecht is not interested in denouncing the moral failure of the small-time war profiteer; she has precisely as much morality as the market allows. In a note to the play, Brecht took Clausewitz's famous quote, "War is the continuation of politics by other means," and turned it into: "War is the continuation of business by other means." Today, it is increasingly difficult to tell the two quotes apart. Brecht chose the Thirty Years' War because he considered it to have been the first capitalist war, the first unleashed by capitalism's desire for new markets. Even if we do not believe in the orthodox version of Lenin's theory of imperialism, the nexus between the market and the war remains a troubling one. The real challenge this play poses today is that it does not content itself with hating the likes of Haliburton but instead forces us to think generally about the relation between free market policies and unilateral interventions.